We manufacture our Oak wooden gates and wooden garage doors from kiln dried Prime European Oak, this is the highest quality of Oak that our suppliers use. As its name implies, it originates in Europe, more specifically Germany, France ,Poland, Croatia and Italy amongst others. Prime European Oak is a straight grained timber; colour wise, it’s a light brown colour and is generally quite consistent; however, as with all timbers, colour can vary from piece to piece and this is to be expected. A sample of Prime European Oak, showing the typical colour and grain detail. Unlike the majority of timbers, with Oak there is a grading structure of all of its own. For example, you have Rustic Oak, Character Oak, Pippy Oak, Prime Oak (and in some cases Super Prime Oak) – you don’t just have an “Oak” gate or an “Oak” garage door. With Prime Oak you have fewer knots than Rustic, Character or Pippy Oak. Pippy Oak features quite a few small knots – these are highly sought after in cabinet making, for example. So for appearance’s sake, if you want an Oak gate (or an Oak garage door for that) with as fewer knots as possible, then it’s Prime European Oak that you want. If you are shopping for an Oak gate and you want to let the gate weather naturally, so it goes a silvery-grey colour then please disregard our Oak gates – we use kiln-dried oak and this should be treated with a stain (or some other protection to keep water out), otherwise you will be undoing all the kiln-drying process; as soon as the gate is installed it will soak up all of the moisture and rain that is thrown at it. 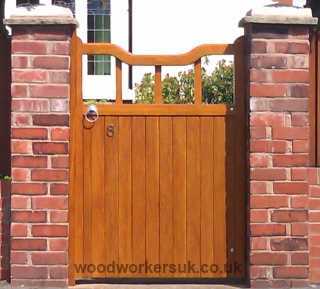 If you want an Oak gate to weather then you want Sawn Green Oak (or at a push, air dried Oak). Sawn Green Oak is wet (hence the ‘green’ in its name) and it is perfect for weathering naturally, if you don’t mind it splitting. Be aware that if you do yearn for the weathered oak look, that before the timber turns silvery grey, it will first stain black as natural oils are released from the Oak first. If you want Oak garage doors and you want to let them weather naturally, then we would not recommend doing this with either kiln dried, air dried or green Oak, as the doors will take in moisture (the air dried and sawn Oak will take less moisture in) and will swell up; in some cases to such an extent that you will not be able to open them. As with Oak gates, they will also split. That’s ok, you say as you’ll plane them down…..which is fine when you’ve got soggy damp weather; however, when the weather does indeed get warmer (it does happen occasionally!) then your nice fitting garage doors will shrink, leaving large unsightly gaps all round your doors. As Oak is not the cheapest of timbers, then please make sure you choose the right type of Oak for your gate or garage door requirements, otherwise you may be disappointed. If you want your Oak gate or door to last as long as possible then choose kiln dried Oak and protect it with a stain. 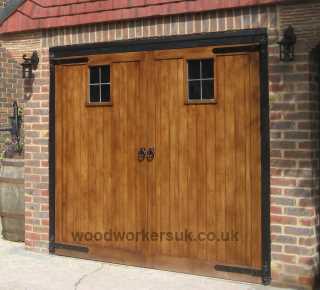 Want garage doors made from Oak? As with Accoya, Oak gates and garage doors need stainless steel ironmongery; this is because the Tannic Acid (this is what gives Oak its durability) will react with any other kind of metal it comes into contact with. Ultimately, if you use any other kind of ironmongery it will corrode and this will result in a blue/black staining on your doors/gates (this applies to all the types of Oak mentioned above). If you are interested in Oak gates or garage doors, as you’ve been told these will last longer than any other timber, then please consider Accoya gates and garage doors – it’s the timber of the future!